Due to me being mostly a translation checker instead of a translator, the way I write notes is different as well. I’m not really fond of having to watch an episode multiple times, so I’m not skimming through the whole episode to find me some interesting facts here and there. In TLC cases, most of the times I’ll be jumping to several of the TLC notes I made and give a small comment about it…probably reflecting the original translation. 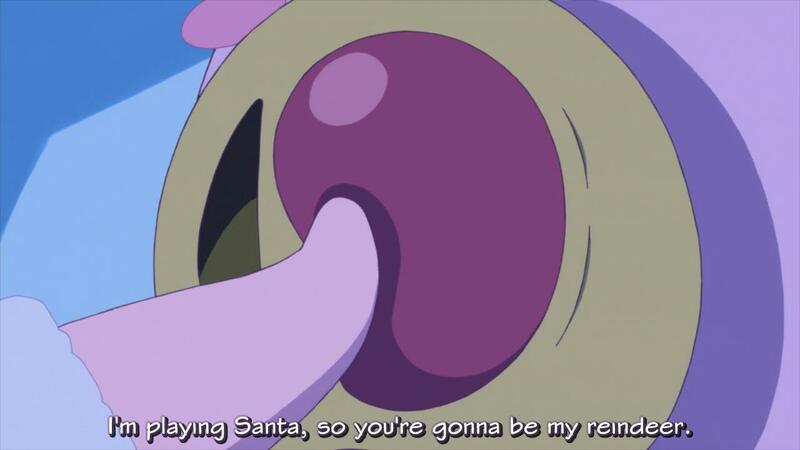 The whole reason they went for a Christmas episode this time (it isn’t Christmas at the time this episode released), is probably to enter some pork pun somewhere unnoticed. Well, I think I found one right here. Santa needs a reindeer of course, but could you guess what the pronunciation for a reindeer is in Japanese? If you guessed something related to pig, then you’re certainly correct. My guesses are that the pronunciation of this word (となかい, tonakai) is the sole reason why they actually made this episode. What do you think? This entry was posted in 2013, Accel World, Anime and tagged accel world, haruyuki, hybrid, kuroyukihime, special by Chrouya. Bookmark the permalink.